Didactic Unit: “Go Green or Go Home” 1. 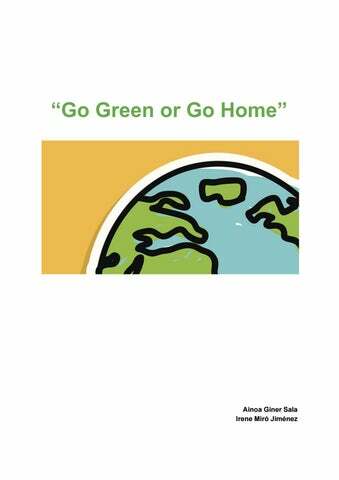 Introduction “Go Green or Go Home” is a CLIL didactic unit devoted to the students of the 4th course of Secondary Education. It has been designed with the purpose of introducing the students to the current environmental problems we are involved. As a result, by the end of this unit they will be aware of how important are the natural resources and how to contribute to its maintenance. The unit has been divided into 6 sessions that will be done at the end of the 3rd term specifically during the weeks from 13th to 24th of May. The reason why we have set the unit in these weeks is because on the 17th of May we celebrate the Recycling day. In this way, the students will have already worked on the concepts and ideas involved in this day and they will be more aware of the importance of this topic as well as being able to cooperate and to contribute to the complementary activities organized by the centre with their work. During the six sessions we will work on the contents and topics needed for the achievement of the objectives set. The first 4th sessions will be devoted to introduce the different topics chosen and to work with the vocabulary and the content through different activities. The sessions 5 and 6 will be devoted to the final task as the students can have enough time to prepare and to do it. This unit has been designed cooperatively with the Biology and Geography Departments even though this is going to be taught in the English class. The students will need to use the language in order to face the different tasks included as well as dealing with the final task, however the contents involved are part of the Biology and Geography subjects. Know what are the current environmental problems and define the main concepts involved. Reflect on the role of humans in these situations and discuss about possible solutions. Learn specific vocabulary about environment and nature. Methodology The methodology used for this didactic unit is a task-based methodology in which the students will perform different tasks during the lessons as a scaffolding for the final task. The approach will be mainly communicative and we will encourage cooperative work during many of the activities. as they can have an idea of what is expected from them. The activity won’t have an specific structure because we want them to develop creativity and to work on structure organization abilities however we will write on the blackboard some ideas or points that must be covered. We will devote session 5 to search, select the information and pictures to create the book. The last session, session 6, will be devoted to the presentations of the book. We will be flexible and we will dedicate some minutes of Session 6 to finish the task if needed. Sessions Session 1 ❖ Climate Change 1) Let’s watch this ​video and pay attention to all the elements. Now, let’s discuss within the class: what’s the topic of this unit? 2) In groups of three or four, give an answer to the one of the following questions. Then, we will discuss them within the class. 1.What is climate change? 3.What is the evidence of global warming? 4.How will the weather change? 5.What is the international community doing? 3) Do you know who Greta Thunberg is? Let’s read the text. Greta is a sixteen year old from Sweden who in August 2018 decided not to attend to class until Sweden’s general elections on September 9th after the heat wave and the forest fires. As so, she claimed the Swedish government to reduce the greenhouse emissions on the grounds of the Paris Agreement. (Sweden’s Parliament) during school hours. She used to bring with her a banner that said ​Skolstrejk för klimatet which means “strike for the climate”. Greta called attention at the international level and inspired students around the world to take part in students’ strikes. More than 1,3 millions of students have gone on strikes and demonstrations since December 2018. 4) Now that you know who Greta Thunberg is, watch and listen carefully to the ​speech by Greta Thunberg. Then, answer the questions. 1) Do you agree with Greta Thunberg? Why? 2) Would you go on strike and skip school to save our planet? 3) Give reasons why climate change should be on top of the political affairs. 4) What measures you think you can take to help stop climate change? Session 2 ❖ Water 1) Look at the picture provided. Think about at least 5 situations in which you use water in a day. Write down your ideas and then share it with the class. 1. Have you ever thought before about how much water do you daily? 2. What is the most interesting fact you find in the Kahoot? 3. Can you estimate how much water do you spend in your family? 3) Now, it’s time to look at the screen! You are going to watch a ​video about how the increasing waste of water in our society. Pay attention to the details, because you’ll have to fill a short questionnaire after the video. 1) The teacher divides the class into two teams: each team will have to decide which objects of the set of ​flashcards are recyclable or not. Time’s up when one of the teams finishes and the teacher will proceed to count both teams’ objects. What are the advices given about saving energy and resources? Make a list of them. Can you explain what is the meaning of the three R? Do you recycle at home? What kind of products? 4) It’s time to think and design! Use your computer to design a meme with a slogan in favour of recycling. You must be as much creative as you can! It’s important that you include some of the vocabulary worked during the lesson as well as the slogan must be motivating and funny. At the end, the best meme will win a prize! Below you’ll find an example of what is expected from you. WE NEED YOU! ​ The planet is in danger and it needs your helps! You’ll find specific instructions about what you have to do to save it in this ​link​. What is the definition of __________ (your topic)? What are the main features of _________ (your topic)? Do not forget to include relevant pictures too! When finishing the book, it’s time to prepare your oral presentation. The next day, in groups, you will present your book to the rest of the class. Here you have some examples as you can get inspired, click on the pictures to see the whole book. LET’S GET CREATIVE AND USE YOUR IMAGINATION! "Go Green or Go Home"